Crystal Group engineers integrate individual technologies, even disparate parts from multiple vendors, into cohesive, comprehensive, and capable systems that meet customer, program, and end user requirements. Call on Crystal Group to specify, procure, inventory, integrate, test, deliver, install, support, and upgrade integrated systems. 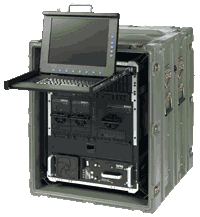 For robust and rugged systems in the field and on the move, Crystal Group’s expert engineering staff provides Transit Case Integration – populating rugged transit cases with a custom combination of devices, including servers, workstations, networking appliances, displays, and more. Contact Crystal Group’s helpful and knowledgeable staff for a or Custom Integration or Transit Case Integration services, a quote, or more information. Whether we build your solution from the ground up or integrate Crystal solutions into your existing transit case, Crystal Group has the engineering expertise and program management ability to assure high-quality, low risk integrated solutions. Our systems engineers work closely with our business development managers to accurately capture your requirements and oversee projects. We employ a system of reviews and check points to ensure you get exactly what you want and need. Programs are managed in Microsoft Project and risk management techniques are employed to ensure optimal use of resources and decision making results. Crystal Group has more than 20 years experience in rack and transit case integration for airborne, seaborne, land mobile, and space applications. To learn what Crystal Rugged can do for you, contact us today.